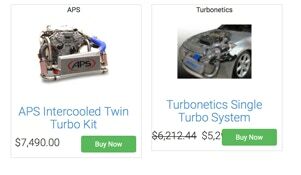 We have had several operational online stores over the years, since 2003 when we started our first store specifically for the all-new Nissan 350Z and the Infiniti G35 Coupe at 350tuner.com, and we learned quite a bit from it. 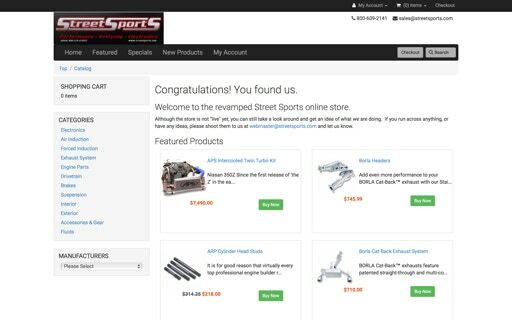 After running several different vehicle specific stores, we decided to have one single full-line store directly under the banner of Street Sports, Inc. We had to have custom work done by our developer to manage dealing with so many makes and models of vehicle. It was a huge undertaking and it worked great, until PCI-DSS came along because of the fiasco caused by the breach of 40+ million credit cards by Marshalls/TJ Maxx. Basically, how we handled the storage of information provided by users of the website, which in our case was how the store remembered which vehicle you had selected as you looked around, could no longer be done in the way we did it. It was too similar to how other websites were using the feature to keep customer’s financial information, even though our site did not do that. Well, that simply broke our store software and without filtering, the site became almost unusable. Until now. This is the current progress on the new online store. There are still a few areas that need work before it can go live, although we can currently place test orders now. The backbone of the system is actually built on the same technology as our previous online stores. The new software, however, is responsive for use with tablets and smartphones. It is also fully PCI-DSS and GDPR compliant. 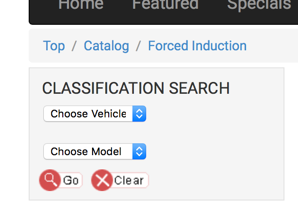 The biggest hurdle, the classification search. Just a fancy name for a Year, Make, Model filter. 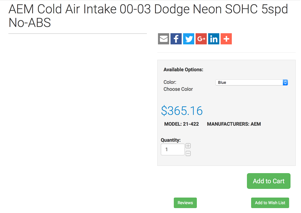 Without it, you could look up something as simple as an air intake or filter and thousands of parts would come up in the results, as it would display every one that we sell. 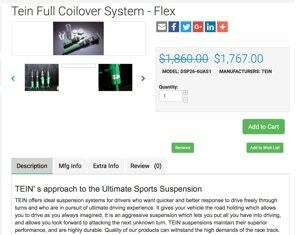 This filtering technology cuts those results down to only the few that work with your vehicle. Another quirk that needs to be addressed is the “Buy Now” button is covering the sale price. I guess we could just never put anything on sale, but that doesn’t seem like it would be a popular decision. I’m sure it’s just a templating problem, but sometimes when you change the base code, it inadvertently affects something else in unexpected ways. Next thing to figure out is how to display variations in products. To the left is one possibility. This takes up a lot of screen space, but does show every variation at once. 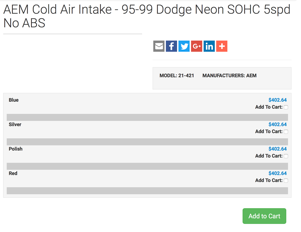 In this case, it shows the colors available for a selected air intake, and you just check the box next to the one you want. This is a second possibility. This is a much cleaner presentation, but does not show every variation at once. In this case, you must click on the dropdown box to reveal all of the variations (see next image). However, in it’s current state the blue color is now a default which could lead to some confusion if somebody forgets to decide on another color they prefer. 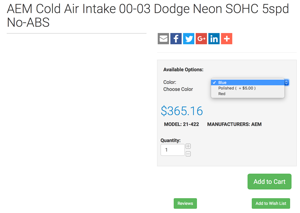 This is the view once the dropdown is clicked to see all variations, as well as seeing add on pricing for certain variations (in this case, add $5.00 for polished). 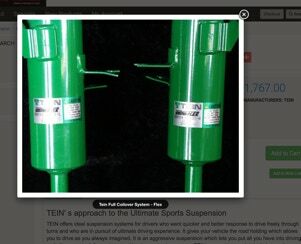 This shows an issue we are having with some images not showing as thumbnails in a slideshow. However, if you click on the rectangular outline that is in between the other two images in the slideshow picker, you will get the full size image (see below). This view shows that the picture is loaded on the server, even though it does not show in the picker. After starting VERY early on the web in 1993 with a presence in the world of America Online (AOL), where we hosted a chat room and IRC (Internet Relay Chat) in order to keep up with our customers, especially in the days of expensive long distance phone charges. Then we moved on to having a BBS (Bulletin Board System) as a first step outside of AOL. Finally in 1997, we got our streetsports.com URL and published our first website using Microsoft FrontPage. The bones of that website still exist in the Old Site link above. We used it until Microsoft decided to kill the platform and at that time we switched to using Macromedia Dreamweaver that was later bought by Adobe and became Adobe Dreamweaver. We are currently redeveloping our original online store with a host of new features, including new content areas, new social media interactions, and tying together our photo galleries and blog.